Set in Guyana, South America, ANTIMAN is a film about self-discovery and masculinity in the Caribbean. 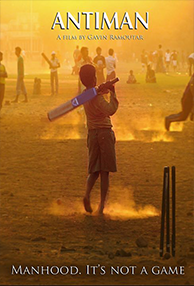 Anil, an introverted young boy, is pressured by his abusive father, Max, to become a skillful cricket player the way he himself was years before. Although skilled in the game, Anil refuses to play and takes refuge in his love for Dano, an older boy in the village. In order to attend the local masquerade and see the boy he pines for, Anil must win the cricket tournament.